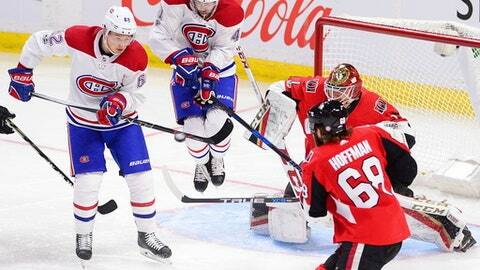 OTTAWA, Ontario (AP) The Montreal Canadiens are starting to believe in themselves after a rough start to the season. Charles Hudon scored his first two career goals and had an assist, helping the Canadiens roll to an 8-3 victory over the Ottawa Senators on Monday night. ”Offensively we’ve been a team that hasn’t scored much, but five the last game and eight tonight so I can see the confidence coming back with the players,” coach Claude Julien said. Artturi Lehkonen also scored twice for the Canadiens (4-7-1), and Shea Weber had three assists. Al Montoya stopped 25 shots in his first victory of the season. Max Pacioretty, Alex Galchenyuk, Brendan Gallagher and Tomas Plekanec also scored as Montreal won back-to-back games for the first time this season. Ottawa (5-2-5) got goals from Tom Pyatt, Ryan Dzingel and Chris DiDomenico. Craig Anderson made just nine saves on 15 shots through two periods before being replaced by Mike Condon, who allowed two goals on 14 shots. Captain Erik Karlsson, one of the NHL’s best defensemen, was on the ice for seven Montreal goals. Ottawa dropped to 2-2-5 at home this season. Hudon got off to a fast start during a wild six-goal first period. The Canadiens entered the game as the lowest scoring team in the Eastern Conference. Pyatt opened the scoring just 21 seconds in, but Montreal replied at 4:27 when Hudon stepped around Karlsson to beat Anderson short side. The Canadiens made it 2-1 when Pacioretty stole the puck from Anderson behind the net and scored a short-handed goal into an empty net. After Mike Hoffman’s shot went in off Dzingel, tying it at 2, Lehkonen and Hudon scored to make it 4-2 after one. The second was a more quiet period until the halfway mark when DiDomenico scored his second in as many games with a power-play goal. But Jordie Benn fed a beautiful pass to Galchenyuk for a breakaway goal and Gallagher made it 6-3 with less than a minute remaining in the period with his fourth of the season. NOTES: The Senators were without D Mark Borowiecki, who was a late scratch because he wasn’t feeling well. C Kyle Turris (Viral infection, day-to-day) and Bobby Ryan (broken finger, three weeks) also were held out. Canadiens: Visit Minnesota on Thursday night. Senators: Host Detroit on Thursday night.